Chris: Hello and welcome to this interview from GetLazy.net. My name is Chris Crow, and joining me from New York is David Matthew Feldman, the puppeteer and voice actor of Mayor Milford Meanswell on LazyTown. David, what's going on? David: Hey Chris, how are you? C: I'm doing just fine. Hey, thank you so much for taking some time out of your day to do this interview with me. I'm really looking forward to picking your brain a bit because you are one of the original cast members, and I'm really looking forward to getting your perspectives as being an original cast member. As always, these questions are coming directly from fans of LazyTown on GetLazy.net, and I threw in a few of my own as well because, hey, I'm a fan too. So before we get started, I hate to ask, and you know it's coming, but I am going to have to ask you to do a bit of the Mayors voice for me, because I need to prove to the fans listening that you're the real deal, and not just one of the local Denver stoners I picked up off the corner. D: Are there a lot of Denver stoners who do Mayor Meanswell impressions? C: Well you never know, you give them twenty bucks and they'll do just about anything. D: Well, you'd have to pay me a lot more than twenty bucks to do that, but...[in character] Hello Chris! Oh it's so nice to talk to you today! C: Very nice. So I'd like to start pretty much at the beginning. D: Oh, okay. I was born, um no, not that far? C: Not that far, not quite that far. How did you discover the role of The Mayor; how did LazyTown begin their casting call to begin with? D: All I know is I heard about an audition at Nickelodeon in New York. I think they were auditioning in other places: in L.A., in London, but I'm a New Yorker. So I heard about that they were going to be in New York, or they were auditioning in New York, and I went. It's a simple story. I auditioned for, I think, all the puppet parts, maybe with the exception of Trixie. So I remember reading these little paragraphs, these little monologues for each character. The Mayor, but also Pixel, and Stingy, and Ziggy, and Bessie, I think. D: Yeah, why not? When you're a puppeteer you could play any part: a man, a woman, a kid, an adult, a porcupine, it doesn't matter; you just take a stab at it. I remember going in and they had sent over from Iceland a puppet for us to audition with, which is kind of silly when you think about it, because we do have puppets in the United States of America. But they sent over one of those original, I'm sure you've seen photographs, one of those original Latibær puppets that Gummi Þor [Kárason] had built. I don't remember why they built it, but it was Stingy. Like, the Stingy we know, it looked like his way older brother, or something like that. So we used that to audition on camera for all the different parts. Then I got a call back to come back specifically for The Mayor, and Magnús [Scheving] was there. He had flown in, and that was the first time I met Magnús. Then a couple of days, a week later, I got a call to come to Iceland to be The Mayor. C: So did you have to come up with the character profile for each character on the spot while auditioning? D: Yeah, that's what you do, they give you a picture. The puppets hadn't been built yet. I don't remember if there were illustrations, or, I seem to recall photo's of maquettes, of the characters. There were little character descriptions. The writers or whomever get together and they write what they think the character is going to be like, and it always kind of evolves from there once the show gets underway, but this was a starting point. So you read that stuff and you look at the picture and you say, "Okay, this is my attempt," and it's just a first attempt to see if you're in the ballpark. That's where we started and I guess of all those, they thought I was best suited for The Mayor. C: The puppets that you auditioned with, that you said Gummi Þor made, they're made under his studio Wit Puppets. I think that those puppets are hideous, but I love them. What do you think about them? D: They had those puppets in these glass display cases in the studio, so we would always walk by them and see them all the time. They have a very unique aesthetic, which is very Gummi. Gummi is wonderfully talented and a wonderful guy who has done all of his work in Iceland, so he's not really influenced by all the other things that we're influenced by, by living and working over here in the States. So he just kind of marches to his own drummer, and that's fantastic. Yeah, they definitely have their own look. We're used to Muppet-y kind of things made out of light material, foam and fleece, and Gummi likes to use this foam latex which is what we used for the puppets on the television show, and it is different. It is definitely different and it's his thing and it's very Iceland and it's very LazyTown. C: Of course, LazyTown was a thing for about ten years before they started doing a TV show, and it was of course being developed into a TV show from the plays, the books, whatever they had beforehand. At what point during that transition of development were you hired? D: I think we were almost the last pieces of the puzzle, and by we, I mean the puppeteers, and probably Julianna too. I think we were hired in November of 2003, or maybe even December. Then we left to go to Iceland for the first time in mid-January of 2004. I remember that because my sister's birthday is January 17th, and we had this little party for her the night before I left for Iceland for the first time. When we got there, it was just this flurry of activity, I mean there were tons of people. It was really overwhelming how many people were there, and they were all running around and obviously they had been there for a long time doing their work, and so they were all running around putting the finishing touches on things: the sets, and the costumes, and Neal Scanlan was there with his guys finishing up the puppets. We came in almost just before we started shooting. I think we had about three weeks of development time for us, to figure things out and get a handle on things, and then we started shooting, so it was pretty late in the game by that point. C: Was the character The Mayor already developed by the time you got there or did you have an opportunity to put your own input in? D: Well, that was my job, really, in those first couple of weeks. Any viable puppet character really needs to come from the puppeteer. I don't think I'd want to meet a puppeteer who can just be handed a puppet and told, "Okay, this is what the character's going to be," and then they just do that without bringing any of him or herself to it. That seems like a very hollow experience for both the audience and the puppeteer. My job in those first couple of weeks was to really find a character in myself. Yes, Magnús had a very specific idea about who this guy was going to be. I think the story goes, think this is right, that that initial characterization, he was basing it on the mayor of his little Icelandic town where he grew up, so it was a very personal thing for him, and it was very hard to get him to let go of that, even a little bit. That was an idea in his head, but I had to deal with the scripts that were being written, and I had to deal with, above all, the puppet. The puppet really helps you find the character in yourself. The puppet cannot be denied; it is a real thing. It looks a certain way, it feels a certain way, it moves a certain way, it has its own rhythm. It's not an idea in your head. It's not even an animated character. It exists in the real world. It's really that interface between the puppeteer and the puppet, I think, that creates the character. And remember, when we're performing, and you probably know this, our eyes are locked on television monitors that are hooked up to the camera that's showing us exactly what the camera's recording, exactly what you'll end up seeing at home. Between action and cut, we are living in that world; we are looking at that puppet to the exclusion of everything else. I'm not looking at Magnús standing off to the side, shaking his head in disapproval because he doesn't like something, or nodding his head in approval because he does like something. I am just looking at that puppet. All of my instincts are being fed through that puppet. I had to take what he was telling me, but reconcile it with the puppet, and make it work for my own instincts. At a certain point we found that sweet spot, where it just fell together. C: How would you describe the character you were trying to create? What were you going for? D: Again, it's not what I was going for, and it's hard to articulate, because it's something you feel. I had to make that character believable with that puppet. 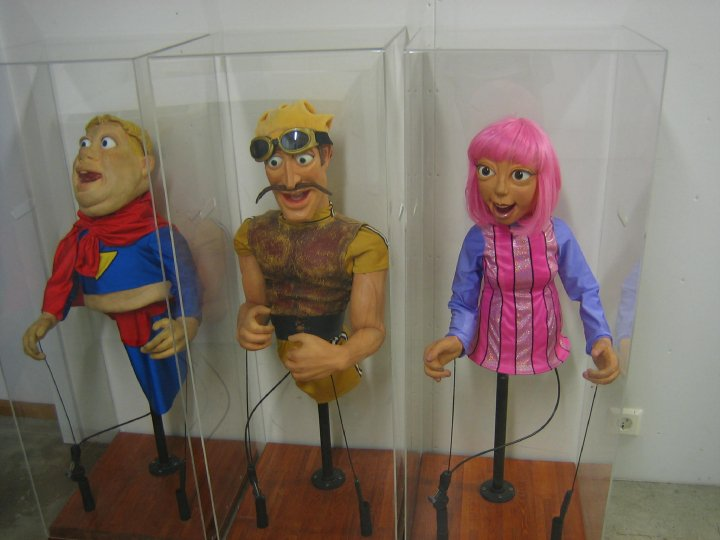 As you know, the LazyTown puppets are very idiosyncratic. They're very, very specific. It's not like I said, "I want to do this." It came from the puppet, it came from Magnús saying, "I want it to be this kind of guy." It's hard to explain, but you will know when you see it. It just has to kind of work. C: Okay, so it's like an amalgamation between the physical puppet, Magnús' input, and your experience as a puppeteer. D: My experience and also my personality, because at the end of the day, it's got to be in me. That's the thing, when you're puppeteering, you're dealing with so much; you're juggling so much physically and mentally, that you can't really think about the character. Who he is, how he behaves, what he sounds like, that all just has to come. Especially when you're working on a television show, where you're hammering these things out. There's no time for anything, you just got to keep going, going, going, and the character's got to be there every time. So it's all those things: it's Magnús, it's me, it's the puppet, it's the scripts. It's all of those things. C: An important part of a puppet's character is the voice. So how did you create the voice for The Mayor? D: I think when I started, and this was even back in the audition before I laid hands on the puppet, you take a stab at it. I saw a picture of him, and I had a pretty good idea of who he was. I knew he was this very avuncular guy, and so what I did was this very sweet, jolly guy, but also very mayoral. More mayoral than he ended up being, like he really kind of had two feet on the ground, he was, "I'm the mayor! Ha ha, I'm the mayor of LazyTown!" Part of what Magnús was trying to get me to do, although I don't think he ever articulated this, but it was there in his characterization, was soften it, so I softened it. So it went from, "I'm the mayor," to, "Oh! I'm the mayor!" A voice is a funny thing, it affects everything. It softened his whole character, in a way. It softened his heart, I think he became a warmer, sweeter character. It softened his brain, I think. Whereas before my first try was a very mayoral guy, where you can picture him actually running a town, the Mayor that we have now, sometimes you kind of wonder how he actually pulls things off, but he does, and I think part of that is actually because his heart was softened. He has a wisdom of the heart that carries him through, and I like that about him very much. I like that depending on the scene he can be the dumbest guy in the room, or he can be the smartest guy in the room, and it works either way. C: Once you started to really understand what you had gotten yourself into with this whole LazyTown thing, what were your first impressions? D: My first impressions of LazyTown are mixed up with my first impressions of Iceland, because I had never been there before. I don't think any of us, any of the puppeteers, maybe except for Julie [Westwood] had been there before. Iceland is a head trip. We arrived in the middle of the winter when it's dark all the time, so we hadn't even seen Iceland until the weekend when we could go out for a couple hours in the afternoon and the sun was above the horizon. That was a strange experience. 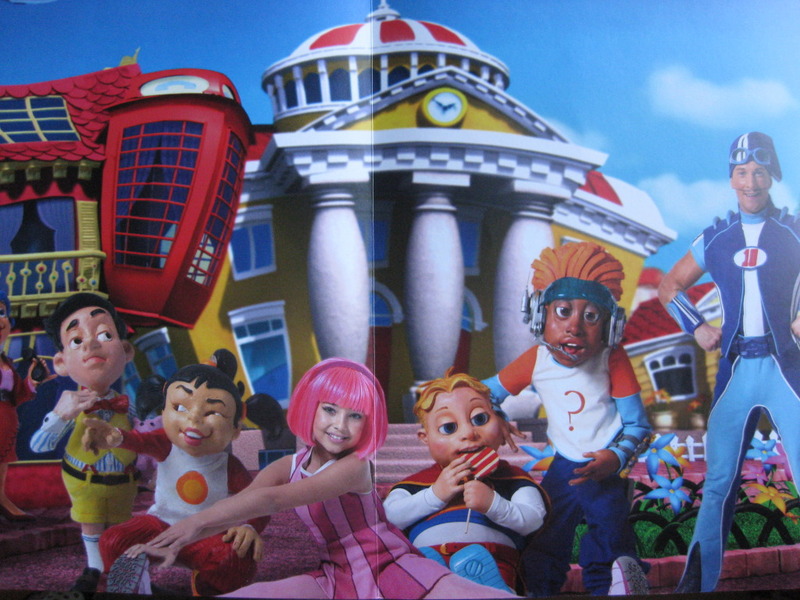 LazyTown is a huge operation; it was very overwhelming. It's got a lot of moving parts. You have all these people who've come from all over the world to do their thing, and in those first couple of weeks, they had to figure out how to do it together, but also how to do it for LazyTown. You could've been a really talented, experienced, camera man, but you were not yet a talented, experienced, LazyTown camera man. You could've been a talented, experienced, puppeteer, but you were not yet a talented, experienced, LazyTown puppeteer. I don't think in all my years there, I ever saw anyone just stroll through the door on their first day of work and get to work and do their job perfectly. There's a huge learning curve with LazyTown, and that was a period in which we were all dealing with that at the same time. It was overwhelming, and it was a huge professional challenge for me, especially since I was trying to figure out who this character was: what's my job here, what am I doing, who is this guy? I think we were all dealing with that in our own different ways. C: So is the Mayor puppet the biggest puppet around on the set? D: Bessie's taller because she's got the hair. Bessie is the heaviest, and then the Mayor is close behind her, and then the kids are further down the chart. All of these puppets are cumbersome and unwieldy, and it took awhile for us to develop our own ways of wrangling all of that, and getting a performance out of it. You don't want to people to watch the show and think, "Oh, well there's a heavy puppet." You want people to watch the show and think, "Well there's The Mayor, he's walking down the street." So you have to work through all of those physical realities to create a guy, or a girl, or whatever it is. C: And how much does that puppet weigh? D: I seem to recall us weighing them once, and I think it was, he came in around eight or nine pounds, which I know doesn't sound like a lot. You tell that to people and they say, "Well I could lift nine pounds over my head easy." But there a two things you have to think about; one is it's the distribution of weight. Almost all of that weight is essentially pushing down on the top of your hand because most of the weight of those puppets is in the head. You're not gripping it like a barbell. When you lift something heavy, let's say you say, "Oh I can lift this barbell," and you lift it up over your head. *Hnnnng! * You're not denying the weight; it's a heavy thing. When you're playing these characters, you can't let on that it's a heavy thing. You can't let on that it's a thing! It's just a guy walking down the street. When you're walking down the street, yes, gravity is keeping you from floating up in the air, but it's not pushing you down so that your knees are buckling and you're almost falling over. You have to push through the gravity, and just play a guy who's walking down the street. You can never let them see you sweat. You can never let them see you lifting this thing. You're just performing this person and he moves the way a person moves. That's the challenge. C: So how long were you able to hold your hand up in the air with the Mayor puppet at a time? D: I think the longest we would be doing a scene is maybe one or two minutes. You could certainly hold it up for a long time, but to keep it alive and to keep it moving in the ways that you want it to move, the shorter the scene the better. C: So there is a LazyTown episode that exists, kind of, called, "The Lazy Dance", and for those who are listening right now that maybe have never heard of it, basically it was the first episode of LazyTown to be filmed, but it was never finished or released because, well, the people at LazyTown didn't really have their crap together, or at least had it together less than they ever did. So they kind of used that episode as the fudge factor, which I'm sure Nickelodeon hated. David, though, you were present and on set during this, so maybe you could help demystify this episode by telling us what you can remember from filming that episode. D: Have you seen it? D: How have you seen it? C: I saw it at the studio. D: Wow. Well, it was a very long time ago, so I only have certain snapshots in my head. I remember doing a scene, I don't know if it was the first scene I ever did as The Mayor, and it was a motif that we repeated several times throughout the run of the show, where The Mayor is asleep at his desk in his office, and somebody comes in, and I think in that case it was Robbie, and wakes him up and startles him, and he has his feet up on the desk, The Mayor, and he falls out of his chair, he falls on the floor. I remember doing that, that was one of the first scenes that I did. That was always a challenge because I'm performing the top half of his body, and then somebody else is on the legs, so that moment where Robbie comes in and startles him and we fall, that all has to happen in sync, perfectly, and Magnús was always a stickler for that kind of thing, so I remember working at that pretty hard. The story was, there was like an official town dance, and Stephanie was very eager to go to the dance and dance, because that's what she loves to do. Sportacus was very resistant, and the reason, we learn, is because Sportacus can't dance. I don't remember at what point in the story he reveals this to the other characters, but he's extremely self-conscious about it. I do remember this one thing where the director, and I don't think it was Magnús, actually, directing that one, setting up the scene where Stephanie and Sportacus get to the dance, and Sportacus doesn't know what to do, and he sits down in a chair against a wall, like a real wallflower at a school dance. He sits there awkwardly, and Stephanie wants to dance, and she says to him, "Here, hold my purse," he's sitting there with her purse in his lap, which was a really funny image. We never quite went there again, poking fun at Sportacus' virility, for lack of a better word. He looked like a husband sitting in the mall on a bench, holding his wife's purse, waiting for her to come out of a store. I don't quite know why that show was scrapped, really. I never saw it, and I never got the full story. I think mostly because it was our first attempt, and LazyTown is an incredibly ambitious show, and you're not going to get it right out of the gate. There is a learning curve, as I said. I think also part of it was maybe Magnús had an issue with the story. It was interesting that that was chosen as the first show to shoot, where you're looking at Sportacus having a weakness, and not only having a weakness, but being embarrassed about it. That's something that on a script level is interesting to look at, you know; what are the characters' strengths, but also what are the characters' weaknesses, how much depth can we give this character? Maybe Magnús thought to himself, "This is not the right way to go with this character," because we never really did that again. After that, Sportacus was pretty darn infallible; just incredibly confident. Any problems he had came from outside of himself. Robbie had created a problem, or there was some sort of physical problem that he had to work against, but it wasn't because he was inadequate. It wasn't because he had some sort of weakness or failing inside of himself, which was a perfectly good thing to explore in the first episode, and I guess it can be seen as sort of an experiment, but maybe that wasn't the way to go with that character. So maybe it was a good lesson to learn about the character, because his instincts were obviously right on, because Sportacus went on to be a character that millions of people all over the world have embraced, and so many kids have wanted to emulate and dress up as and be. I'm sure in his eyes that was the best compliment. There may have been other reasons, too; technical reasons and whatever, because remember, we were all trying to figure out how to work together at that point. I think we started to figure it out pretty soon after that. I don't remember what the second show was or the third show was, but they were aired and people seemed to take to it, so we started off on a roll, I guess. C: Did you have any creative control over your character during filming, or were you kind of made to closely follow the script? D: I'm going to pause here to let whatever colleagues are listening to this laugh. I read the script with a pen in my hand. That was not a reflection on the writers, we had great writers who came up with some really fun, funny things, but they have to juggle nine characters, and I just have to think about my one character. I would tweak things, I was definitely not shy about that, and they let me do that. That was one of the wonderful things about LazyTown. Magnús had very specific ideas about the bigger parts of the show, the action and all that sort of stuff, but when it came to the words, which is what I love, he kind of gave us free reign. So I would tweak things, I would change a word here or there, the way he was saying something, I would maybe try to punch up a joke a little bit. I don't know if I was really successful, maybe sometimes the written joke was better, I don't know. I would avoid doing anything more than that, I mean, it happened, but I would avoid doing anything where I had to bring other people in on it. I didn't like going to the set and saying, "Hey I just changed my line, so that means that now you have to say this, and then I'm going to say this, and then you're going to have to say..." I didn't want to do that, I didn't want to inconvenience people like that, and I certainly didn't want to do anything that required the director to get involved, or to go make another prop or something like that. But for the most part I would just tweak things here and there. C: I know that I'm going to have a lot of listeners from the U.K., and don't get me wrong, I think that your accent is lovely, but the U.K. dub of LazyTown is atrocious. David, you were spared the butcher's cleaver when it came to that, so how did you avoid getting dubbed over? D: I remember shortly after we finished the first season, getting a call from someone, I guess it was at the BBC [British Broadcasting Corporation], saying that they were going to start to air LazyTown, and they had, I don't know if it was a policy or just a custom of dubbing over voices, even if they were in English, with authentic British accents, and would I be willing to come and audition to be the British incarnation of the Mayor, which I thought was a little strange. If I remember correctly, they were not going to finance this trip at all, even for the audition. We would have to pay our own way, we would have to pay to stay there, and then their would be, obviously, no guarantee that we were going to get the job. So, I thought about it for a little bit, and I think initially I didn't want to do it, but then I thought, "You know what, that might be fun. That's a new experience." I tried it out, I thought, "Well what would that sound like?" I remember, doing it for my wife and saying, "Okay, here's the Mayor with a British accent," and I did it and she listened to it, and she said, "Okay well go ahead, do it, when are you going to do it?, and I said, "Well, I'm doing it!" There was something about the Mayor voice, where, it wasn't coming through, and I'm not an accent guy, so maybe that had something to do with it. I also think that I am doing a little bit of an affectation. I don't know if you can call it an accent, I'm sure people in the U.K. would not call it an accent, but there's something that's already there, that in my brain is sort of in the ballpark of a British accent. I'm just going to go there and do, or at least to their ears, do exactly what I've been doing, and it would be a complete waste of time. I called him again, and I sort of explained things, and I said, "Why can't you leave The Mayor as he is?" I remember part of my argument was, Stephanie is not going to have a British accent, and The Mayor is her uncle, so why should he have a British accent? Amazingly I convinced him! I was actually kind of taken aback by that. He said, "Okay we'll leave him alone, we'll leave The Mayor and we'll leave Bessie alone." I think it was the right thing to do, and from what you're saying, would've been the right thing to leave all the characters alone. 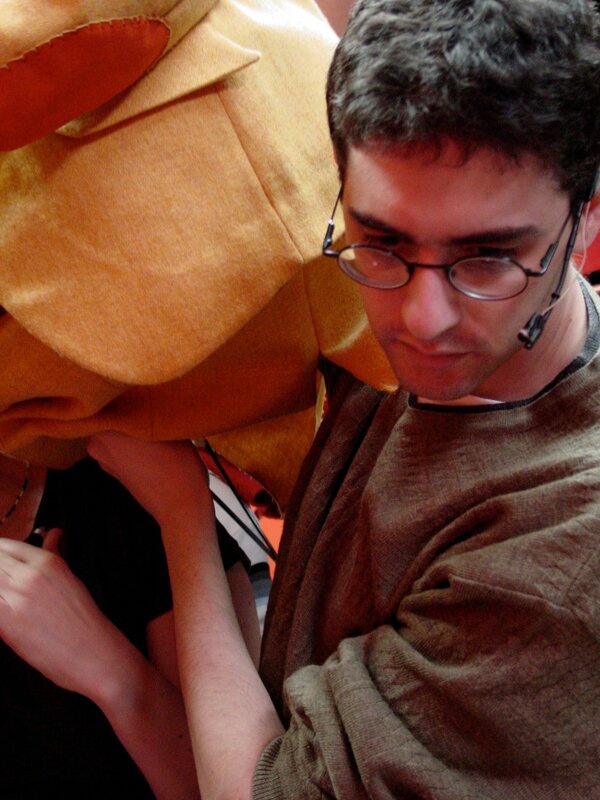 Puppetry at its best, is an organic thing; it's like a magic trick. It all happens from he same brain at the same time, and when you start to deconstruct it and then reconstruct it, crazy glue it back together again, something is going to seem off. That might be what you're picking up on, or you just might not like the voices. Also remember, you're used to the voices on the show that you fell in love with, and as we all know from television shows that we grow up loving, it's hard for us to accept any sort of changes. and somebody else doing the puppet's voice. I think that's a big part of it. LazyTown is, of course, a very musical show. Everybody in town is singing, except for you. So what's the deal with that? How come you got the shaft on the songs? D: I think the answer is the opportunity just never came up. You can't just say, "Hey, why don't you write a song for The Mayor." God knows I've tried, because I wanted to, I really wanted to. But there's a format to the show, and the song is the centerpiece of the show, it is directly tied to the narrative, and usually it's sung by Stephanie. There have been a handful of Robbie songs, every once in a while one of the puppet kids, especially Stingy, has gotten to do some vocals on the songs. Sportacus had like one or two in the beginning, but then I think that kind of went away, right? I just don't think that the story was ever there, where it had to be The Mayor's song. I'd like to think that if we did ten or twenty or thirty more episodes, that somewhere in there there would be a Mayor song; we just never hit it. I would have loved to have done a song. I think it would have been a lot of fun, and I appreciated that Máni [Svavarsson] called me in to do some stuff for the chorus for some of these songs in the third and fourth seasons. I want to do a Christmas album with Bessie. I think that's what we should do. "Milford and Bessie: Home for the Holidays." C: I love the sound of that; that would be incredible! What episodes or scenes would you say, in LazyTown, were the hardest for you to film? D: There was nothing that was easy, I can tell you that much. LazyTown is not the kind of show where it's like a sock puppet, and you can just put it on your arm and lift your arm up in the air and do whatever you want. Every moment, every second, required really sharp focus to make it look good. But I guess there were some things that were harder than others. It's always challenging when you get crammed into some uncomfortable, tight, space, and you have to still perform as if you were standing up and you had all the freedom in the world, so I remember being crammed underneath benches and stuff like that. 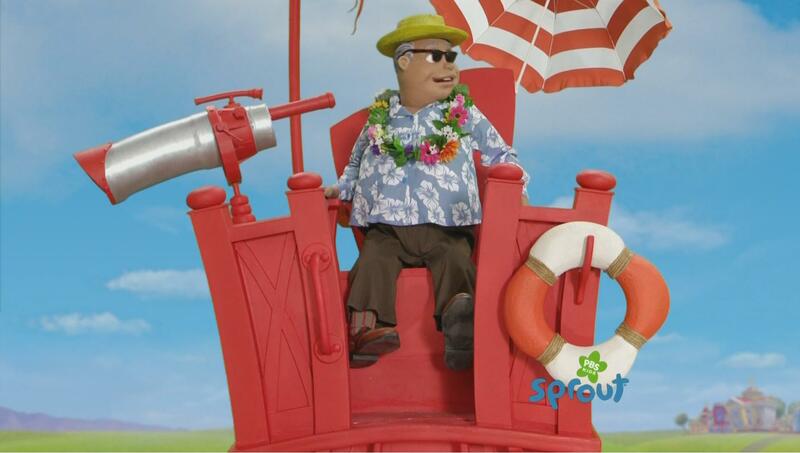 We did a couple of beach shows where The Mayor is sitting up in that lifeguard chair. That was a beautiful lifeguard chair they built, but I'm crammed into this tiny little space just below the seat of that chair. When I saw it, I couldn't believe it. I thought, "That cannot possibly be for a human being." But, you make it work, and then you've got a story to tell. Certainly people have a lot harder jobs than this, let me put it that way. C: LazyTown shot over about ten years, four seasons, and LazyTown Extra, but we don't really talk about that. D: Oh, really? Well, I'd love to talk about LazyTown Extra. C: Do you want to talk about it? D: LazyTown Extra is, I think, the best stuff we ever did. D: And I'm talking about the stuff we did in-studio. We did all those scenes with The Mayor and Stingy, and The Mayor and Bessie doing the news, and then I think Pixel was at his computer, and Trixie, she was in the kitchen with Stephanie putting together healthy snacks and stuff like that. That was a dream for the puppeteers, and as far as I'm concerned, it shows in the final product. That was, for me, the best representation of what we could do as puppeteers with those puppets and those characters. It was all very puppet-centric. It was not only puppet-centric, but it was character-centric. The scripts were about the characters. We weren't there to queue up a stunt or a music video, we were there to just interact with each other, and remember, this was three or four years after we started, so we had been living with these characters for some time. When Jodi [Eichelberger] and I are doing those scenes, it's The Mayor and Stingy just having the time to just interact and breathe and really relate to one another in a way that I think really fulfilled the potential of what we were doing. What we shot is what you see. It wasn't subjected to the LazyTown post-production machine, which involves a lot of editing, a lot of cuts, and a lot of ADR [additonal dialogue recording]; a lot of looping. I don't think we looped any of that stuff. Watching that stuff is like grabbing a chair and sitting down in the studio, and just watching us perform. I accept that editing and ADR and all of that is part of a television show, but it was a wonderful, pure little window into what we actually do. When people ask me about the show, and what I do on the show if they're not familiar with it, I always send them off to look at the LazyTown Extra scenes. So I'm very proud of that. And also, there's no Sportacus, there's no Robbie, there's really no Stephanie, so in terms of the logistics of shooting, it was all about us. Everything was in service of the puppetry: the lighting, the camera angles; we were the priority, which was a wonderful luxury on the show, because I understand the show itself is really about the three actors. C: To get back to the original question, considering that the cast, for the most part, over the ten years of production, stayed the same, would you say that everybody worked pretty well together? D: Oh yeah, I mean that was one of the best parts of LazyTown. Some of my favorite people in the world are people that I worked with on LazyTown. Magnús really picked the best people. Not just the best people for the job, but the best people. C: One of the cast members that did change over the years was the role of Stephanie. Was there a huge difference between working with Chloe Lang compared to Julianna Mauriello? D: No, and I mean that in the best possible way, because they were both so spot-on; they were both so professional. When they were there on set, you never had a problem with either of them, they were just perfect. Certainly, in-between takes or off the set they're different people, so yes, there's a difference between the two of them, but no, it was the same each time, and by that I mean flawless and trouble-free. It was great, they were great. That was one of the real gifts of LazyTown for me, which is getting the opportunity to work with and get to know these two terrific people. C: After working with LazyTown for so long, David, how did your impressions of LazyTown evolve over the years? D: It became a second home to me. We all figured out our jobs, and figured out each other, and it became a great place to work. I'm very grateful to LazyTown, because it gave me the opportunity to do what I love to do in a very unique and challenging environment. It never stopped being challenging, it never stopped being hard work, but that's for the best. It ended up being a place that I'll always value, really. I'm very lucky to have been part of LazyTown. C: Can you remember the last scene that was shot for LazyTown, or maybe the last scene that you particularly shot? D: Yes! Would you like to know about it? D: Well the last show we did was the pyramid show, and I think the last thing we did was, what's usually the last thing that we shot in any episode, was Bing Bang. So I think it was Magnús and Chloe dancing to Bing Bang, and then the last thing I shot was The Mayor dancing with Bessie to Bing Bang, but, if you've seen the show, you will know that The Mayor and Bessie are not in that episode. The story goes that at one time they actually figured quite prominently in the script; they had a lot to do. I remember they were in The Mayor's plane, which was great, because I always love to do that, and I think they were integral to saving the day in that one. That was the last episode we shot and when you get down to the wire like that, the clock starts to tick a little louder, and people start to count the days, and the hours, and the minutes, and they rewrote that script and simplified it, tremendously, because we were running out of time. Part of simplifying it was cutting out The Mayor and Bessie entirely, which was disappointing, because it was one of those scripts where I was really looking forward to doing the stuff. I remember that the costume designer, María [Ólafsdóttir], who's this great, wonderful costume designer and a great, wonderful lady, she had already finished making all those wonderful Egyptian costumes, including costumes for The Mayor and Bessie. She heard that they were cut out of the show, and she got upset, and I think she was one of the few people, because she's known him a long time, who could march up to Magnús and complain about things. He said, "Okay, okay, okay, we'll put them back in." We didn't do what was in the script, that was gone, but we did these almost improvised scenes. He had this vague idea in his head of what they might be doing, and so we just kind of improvised these little scenes and we all pitched in and built the scenes together. And I knew in the back of my head that they were still going to get cut out of the show, because there's only so much time in a show. That included doing Bing Bang, and I think that was the last thing I ever did. It was great, because everyone had come down into the studio: all the people in the offices, and the post-production, everyone got on set to watch the final shots of LazyTown. So we had this big crowd gathered as Bessie and I danced to Bing Bang, and then we did Magnús and Chloe doing it, and then it got even bigger, and it was really wonderful. It was always great to watch them dance, because that Chloe was so great at that and... that's that. C: Was there any kind of big, grand going-away party or do you really never know if you're going to be coming back for more? D: Well, we had a wrap party, but we were told, not in any sort of official contractual way, but we were told that there would be more seasons. In fact, all of us foreigners left a lot of our stuff there. I don't know where it is now, probably in a dumpster somewhere in Iceland. We had pillows, and comforters and all sorts of things, so we left that there because we thought we would be coming back, and who knows maybe we will be coming back. I never, ever, count LazyTown out. You can't do that with LazyTown; you never never know. But for the time being it looks like I'm not going to be getting my pillows back. My daughter is taking a yoga class at school, she's in kindergarten, and she said to me, "Dad I need a yoga mat for this class," and I said to her, "Well, I've got good news and bad news. The good news is, I have a yoga mat. The bad news is, it is sitting in a dumpster in Iceland." C: What would you say was your favorite moment of The Mayor's? D: Like I said, my favorite stuff was LazyTown Extra, it really was. It really represented a wonderful collaboration of all of us. It was, I think, the puppets doing what they do best; having the room to do what they do best, having the room to breathe and really interact with one another. That's my favorite stuff by far. I guess in the show itself, I always liked being in the plane, I know I was complaining before about getting scrunched into tight spaces, but I always liked being in the plane. I totally figured out how to how to do that. I was on my own and I was doing my thang and it looked good. It was cool. I loved being in the plane. C: Here's a good one, and I don't know if you're going to know the answer to this one, but is Mayor Milford Meanswell Stephanie's uncle on her mother's side or her father's side? D: I really don't think there's an official answer to that question, and if there is, I've never seen it; nobody's ever told me. I really don't think that anyone really thought that far. I did, because when you start to play a character you create a little backstory for yourself, and I'm not going to share that backstory with you, but, as far as I'm concerned, he is on her mother's side. C: Why won't you share the backstory? D: Because it's my backstory, and that's that. Here's an interesting question for the fans listening, and I think I'm probably going to include it in most interviews: what do you think about the fact that there are adult fans of the show, when the show is clearly marketed for little children? D: I think it's great, because I think the show is not designed exclusively with kids' sensibilities. There are shows like that and intentionally so. There are shows like Dora [The Explorer] or Barney [The Dinosaur] back in the day, that adults couldn't figure out but kids loved it. But most shows are made for kids, but the people making them are getting a kick out of it. It's appealing to something in them that's not just a kid's sensibility. I think LazyTown definitely falls in that category, so the fact that there are older people watching the show, to me just means these are people who like music; these are people who like dancing; these are people who like cool looking things, because LazyTown is a cool looking show; these are people who like funny stuff, because LazyTown can be funny. I don't find it odd at all, really, and you're talking to a guy who loved and watched Sesame Street and The Muppet Show long, long after I was "supposed to," so I totally get it. If you find something in this world that you love, that inspires you, that speaks to you, that comforts you, then love it. C: Are you still in contact with any of the people from LazyTown? D: Yes, mostly the puppeteers. Some of them I actually work with from time to time, Ron Binion for example. In fact, I just went to the movies with him last week. So yeah, I love hearing from them, I love talking to them, they're great. C: Now, if Turner had decided to keep LazyTown going and called you right after this interview to go shoot more episodes, would you do it? D: I would want to do it, yeah. I love the character, I love the people, as I've said. I would definitely want to do it. C: Here's a question, it might be my favorite question in this whole interview, I love it. If you were the Mayor of LazyTown, what would you do? D: I don't think I could follow in the footsteps of Milford Meanswell. I think he's the perfect mayor for LazyTown. I would not want to live and work in his shadow; I think he's perfect. I wouldn't take the job; I'd want Milford to do it. C: Are you working on any projects right now? D: Yeah, I am. I have a show that I co-created and co-write that you can see on the PBS Kids website, it's called Oh Noah!. That's PBSkids.org/noah. It's a little animated show, and we're still writing it and hopefully we'll be doing more and more of that in the future, so that's what I'm busy doing at the moment, and then I do other puppet things here and there as well. C: Something fun that I like to do with these interviews is pitch out some really quick rapid fire questions; really short questions with really short answers, what do you think about that? D: Is this like that James Lipton thing where you ask me what my favorite curse word is? C: Well I kind of am. D: Well I don't know let's see, maybe you are copying him. Go ahead, ask me the questions. C: Alright, are you ready? C: Do you use the Oxford comma? D: What the Hell is the Oxford comma? C: Do you still have your tonsils in? D: Let me check.. yes! C: What is your favorite type of weather? D: I don't know, I don't go outside enough to really have a favorite kind of weather. C: Are you right handed or left handed? D: Let me see.. I'm right handed! C: Do you have any tattoos? C: Have you ever intentionally eaten an insect? C: Who is your favorite author? D: Well, I spend my evenings reading to my kids, so I'm going to say my favorite author is Dr. Seuss. C: Do you pick pennies up off of the ground? D: Yes! Well only if it's heads up. C: How tall are you? C: Alright David, well that's all I have for you. C: Yeah! Once again, thanks so much for doing this for me, and for all the other fans of the show. I'm really glad to hear that you put a lot of yourself into The Mayor, and are not just some kind of mercenary puppeteer for hire. I do have one more thing before we go: do you have anything to say to the fans listening to this interview? D: I think it's great that you guys have embraced the show, and you have found something in it that you love, and don't let anybody tell you not to love what you love. If it's LazyTown or anything else, keep doing it, keep watching it, keep, uh, I dunno I'm looking for a LazyTown quote here but, all I get to say is, “Oh My,” so, [in character]"Oh My!" C: Well thanks David for such a great interview, and of course thanks to all the LazyTown fans out there who have taken an interest in this series of interviews from GetLazy.net. There will be a transcription of this interview available, and that will be at GetLazy.net/forums, and there will be a link to that in the description of this video. And hey, while you're there, why don't you go ahead and register if you're not already because if you are a LazyTown fan and are not posting on GetLazy.net, I don't know what you're doing. At the very least, you will be able to know about and participate in any future interviews from GetLazy.net. If you'd like to know a little bit more about David, he has done a few more text based LazyTown interviews. There has been one with , which is a LazyTown fan site, and also one with Mark Valenti, who was a writer and creative force on LazyTown, and those will both be linked in the description if you'd like to check those out. Once again thank you so much for listening to this interview from GetLazy.net, and I, or maybe somebody else will see you next time. Special thanks to Glanni's Girl and boblbee for helping with the transcription. The way he talks about the puppet, it not being denied, sounds almost like Paul Fusco (the Alf guy). He also thinks the puppet is real, though I know what he means. 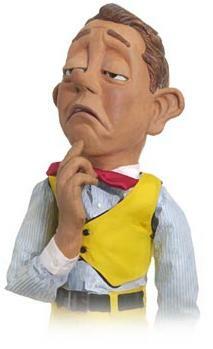 But still I find the man/puppet bond very fascinating. Wunderful interview! To my ears some of his answers in there sound like Mr Feldman was reading from a script though...kinda like someone running for president? To my ears some of his answers in there sound like Mr Feldman was reading from a script though...kinda like someone running for president? Nah, he wasn't speaking from a script, I can tell you that. I think that President might be aiming a little too high for him; he seems to be perfectly content as Mayor. Besides, it seems like presidential candidates these days just say whatever the hell they want. I can't thank you enough for including this question. He seemed to respond very generous to that question though. I would have feared a clear and downright disgust to this matter, but actually seemed understanding towards it. Had you had the opportunity to ask Julianna that exact same question, I cannot even begin to realize what the outcome might have been.. It's really a shame though. I have been reading a lot on the forum the last couple of days, and it's frightening what really happened to JRM. Hearing from Chloe Lang's interview, that JRM didn't even talk to the new Stephanie, just gives an even bigger expression on how much she wanted to get away from it all. Just trying to imagine what this little girl could have done, and what she could have achieved, makes my heart break a little. She had the full package, and could sing, dance, and act as a professional, even though she was only a child. And now we will never get to see more of her talent, just because some psychological underdeveloped grown men, could not differ from a child and a woman. Never the less, once again a wonderful and professionally done interview. Do you have any plans regarding more interviews? I know you have talked about doing more of the puppeteers, but what about the man himself; Magnús Scheving? Or perhaps Stefán, the longest member of the cast? I really think he could add a whole new dimension, as he could talk about the big process of going from the theater scene, to performing the LazyTown show, we know nowadays. Now, this might be wish thinking from my side, but if you got all of these interviews done, maybe it would encourage Julianna to finally step forward, and do that interview we are all longing for. Not to get to know her even more, but to finally put all of this to rest. She has grown very older and mature since her sudden leaving of LazyTown, but her image and status will forever live on. The earlier seasons will be re-aired over and over again, and she will keep getting newer fans for every time. Again, this might be me longing for that final closure, but if you don't put your wishes out there, they will certain never happen. Anyway, I'm getting off of track here. Thank you for this interview, and thank you for highlighting some of the people, that normally wouldn't get as much of the shine. A character as Mayor Millfort certainly deserves just as much right as the main characters of this show. Do you have any plans regarding more interviews? I know you have talked about doing more of the puppeteers, but what about the man himself; Magnús Scheving? Or perhaps Stefán, the longest member of the cast? Yes, more interviews are planned. Both of those people would have interesting perspectives, so yeah it would be cool to get them to do one someday. Loved this he was and is my favorite voice actor in the show. This was a joy to listen to and to read! The Mayor is one of my favorite characters, and his actor seems like a really nice guy!